The Family and Community Engagement (FACE) program delivers professional development. coaching training and technical assistance to a network of educational and parental leaders and community members to build family, school, and community partnerships across Alameda County. A clearinghouse of research, tools, and resources for family and community engagement programs. Over 40 years of research linking the various roles that families play in a child’s education—as supporters of learning and development, encouragers of grit and determination, models of lifelong learning, and advocates of proper programming and placements for their child—with indicators of student achievement including student grades, achievement test scores, lower drop-out rates, students’ sense of personal competence and efficacy for learning, and students’ beliefs about the importance of education. A framework of six major types of involvement based on the results of many studies and from many years of work by educators and families in elementary , middle and high schools. 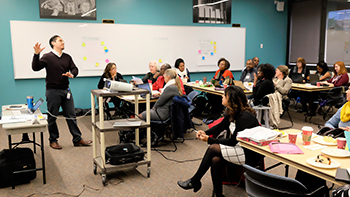 The framework helps educators develop more comprehensive programs of school and family partnerships. The six types of involvement are: parenting, communicating, volunteering, learning at home, decision making and collaborating with community. Each year school districts, along with their stakeholders (parents, students, teachers, union groups, and community members), review progress on the implementation of the current Actions, Programs, and Services that are identified in their Local Control Accountability Plan (LCAP). When necessary, they work to revise the Plan to better reflect current and changing needs that will best serve all students, specifically low-income, English Language Learners, and Foster youth. Alameda County Immigration Legal and Education Partnership is a hot line to use for anyone who would like to report ICE activity or who has been detained. This number is available 24 hours a day. The number to call is: 510-241-4011. They are able to serve people in multiple languages. Speak to an attorney about your immigration needs or concerns!